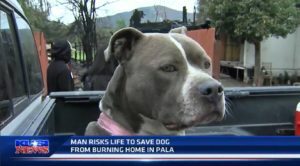 Jose Guzman displayed heroism and blind love when he ran into his burning house to rescue his beloved two year old pitty, Gabbana. The dangerous and dramatic rescue was caught on video by the landlord’s son-in-law, Adam Guzman and published by KUSI in San Diego. Devoted father and family man, Jose was attending a barbeque with his fiancé and their three daughters nearby at the home of his parents. He noticed the smoke and fire and decided to go see what was going on. When he arrived at the scene he was shocked to find that his house was the source of the flames. The fire started at his neighbor’s house, spread to his and eventually to the next home over. Firefighters had been actively fighting the fire but as the video shows, the were running out of water and were awaiting assistance from other stations in the area. Just as the water is slowing to a stop, Jose made the decision to rescue Gabbana. And for that, we applaud you. 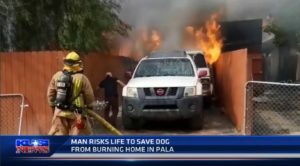 The video shows him pushing past firefighters, coming back to listen to a firefighter’s order to stop, and then going ahead through a thick wall of flame, despite the warnings. Members of the crew fighting the fire are seen coming in and out of the shot, possibly determining who should go after Guzman. As onlookers nervously pace for a nail biting 20 seconds, Guzman and Gabbana come running out to the relief of everyone on scene. The video has gone viral with over 3 million views on Twitter alone. Jose suffered second degree burns to his arm, face, side and ear and sweet Gabbana was burned on her nose and paw. Both should make a full recovery. Examples like Jose prove to us what dog lovers everywhere know to be true. The bond between human and canine knows no bounds. We will jump from bridges, walk across frozen ponds, and run through fire to help a dog in dire need, even if we don’t know the dog in danger. This unshakable bond goes both ways. Whether it’s a little bit each day by making our lives more meaningful or with the same valor, guts, and glory needed to save a life in immediate peril, dogs save us, too. Jose is a hero and Gabbana is one lucky pup to be in the care of his loving arms. The family lost all of their possessions in the fire. If you’re so inclined, you can help Gabbana and her family rebuild their lives at this Go Fund Me account.